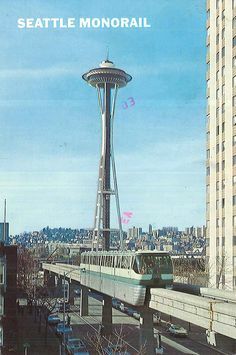 Pullman #993 eastbound on Pike Street at Third Avenue in March1969. 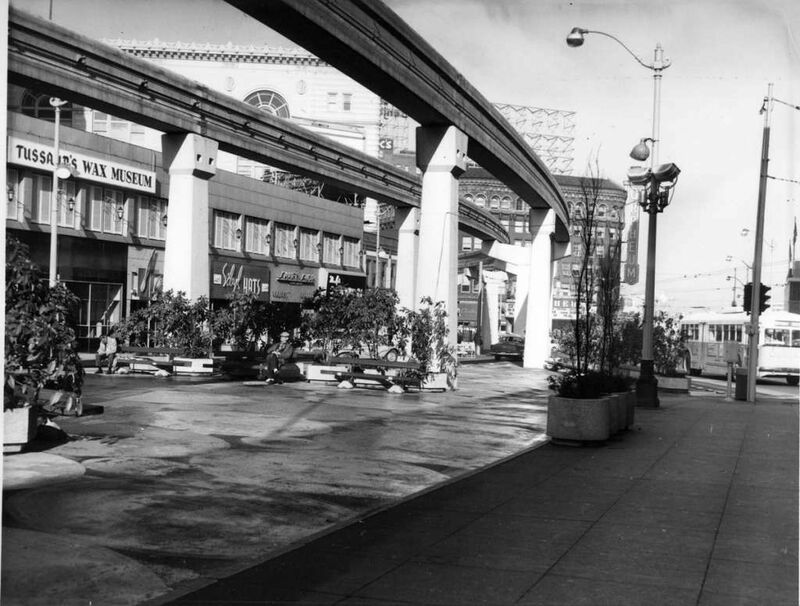 - Photo by Harre Demoro courtesy of the Mike Voris Collection. 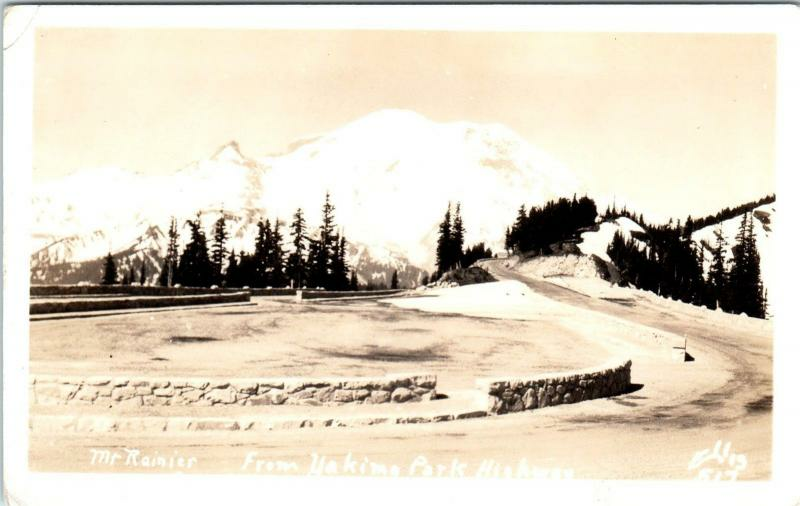 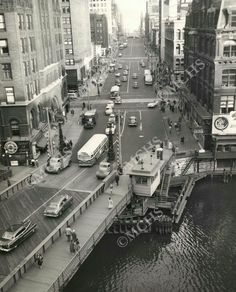 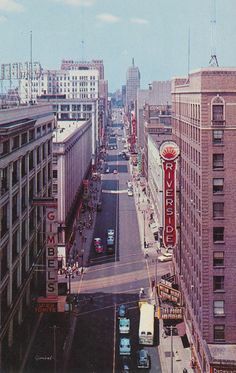 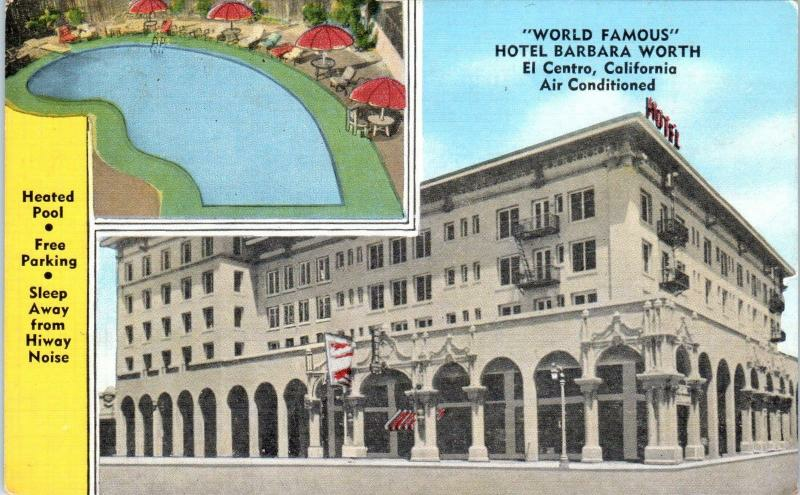 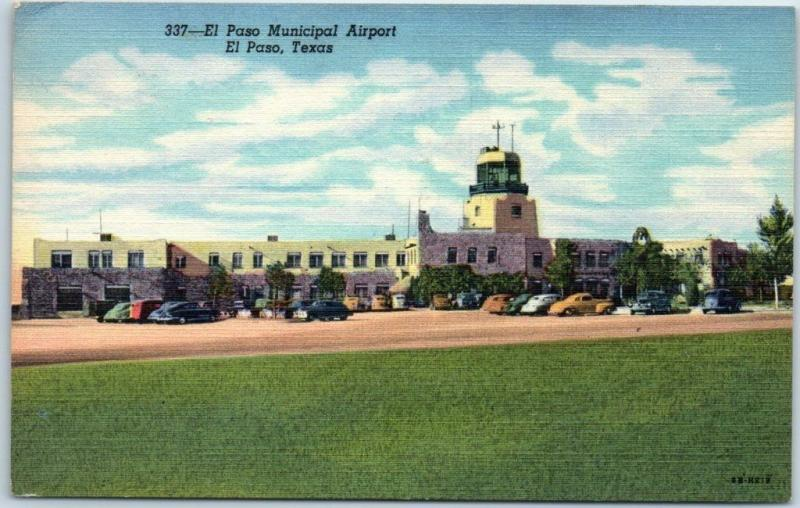 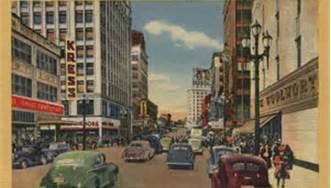 Madison Park circa 1950. 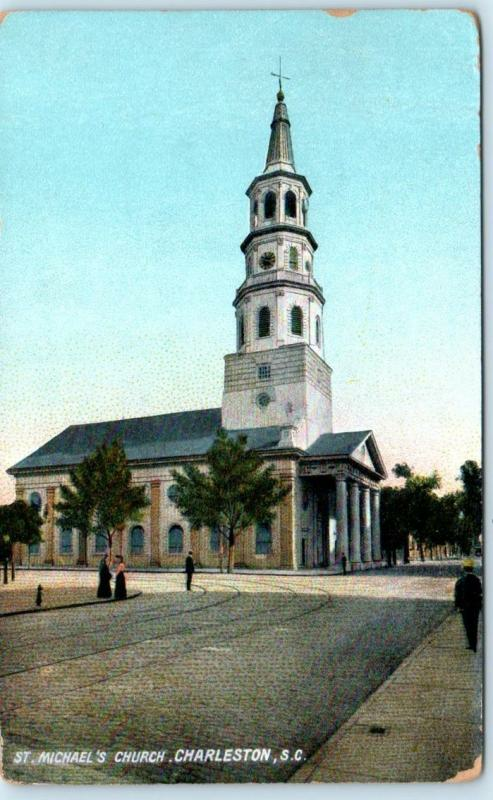 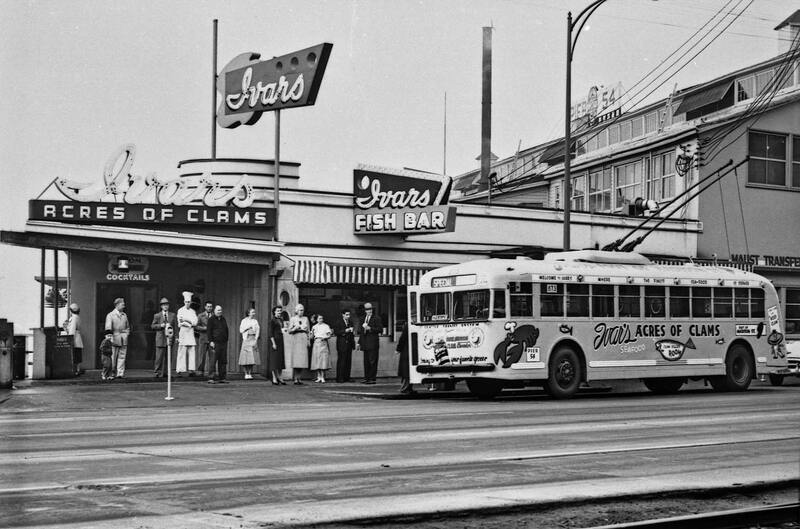 Photo by Ira Swett courtesy of the Mike Voris Collection. 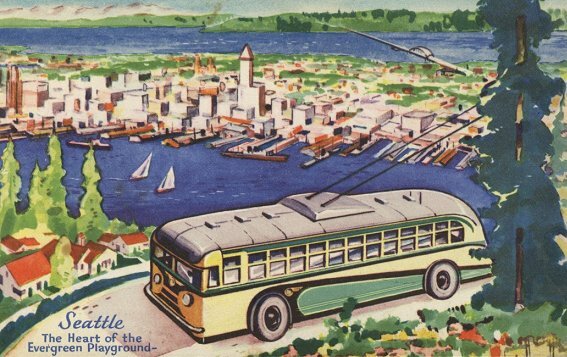 "Seattle-The Heart of the Evergreen Playground" postcard. 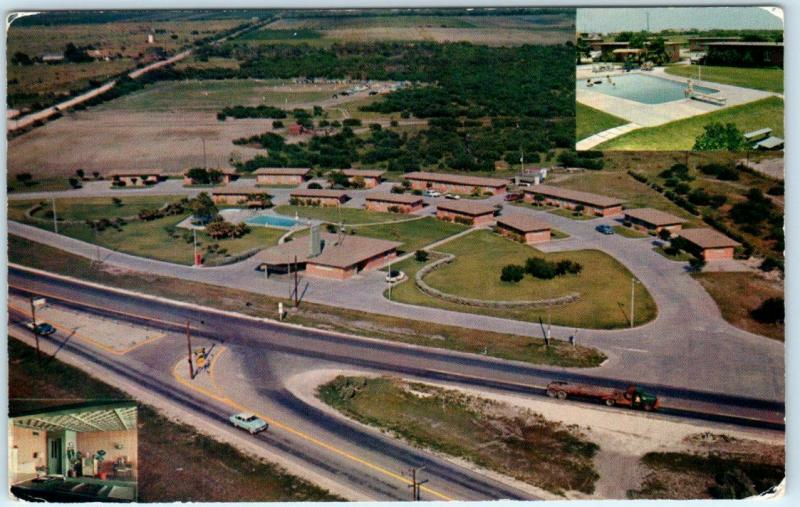 Courtesy of the Mike Voris collection. 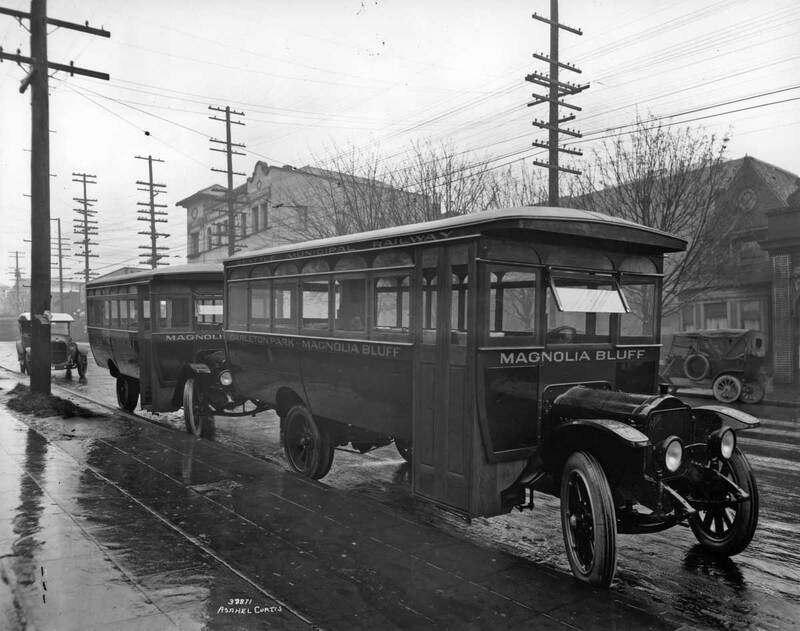 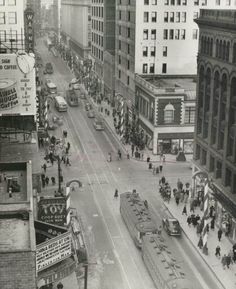 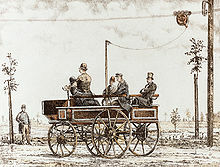 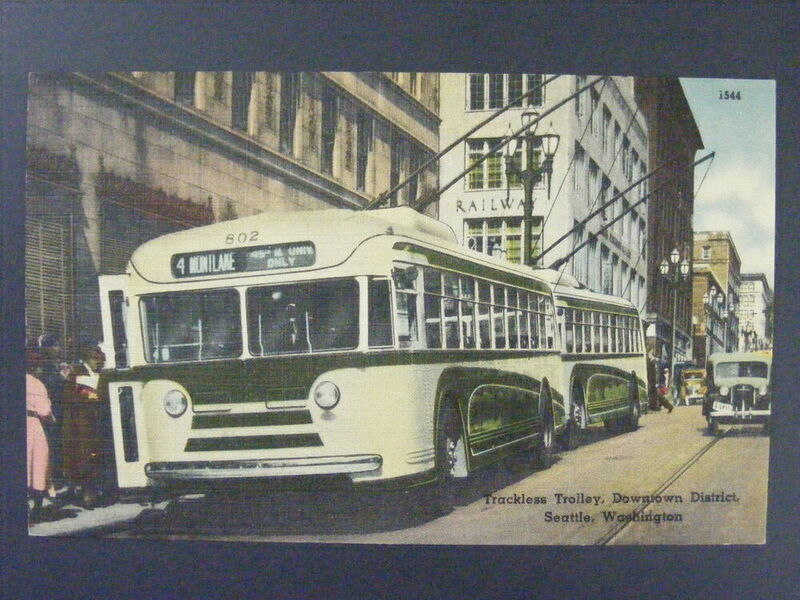 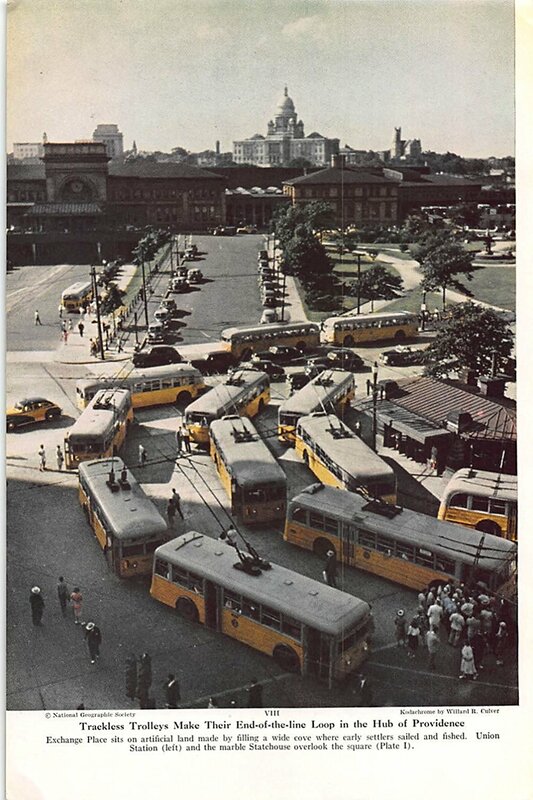 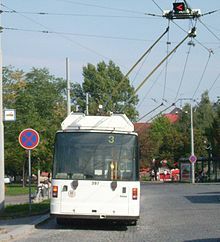 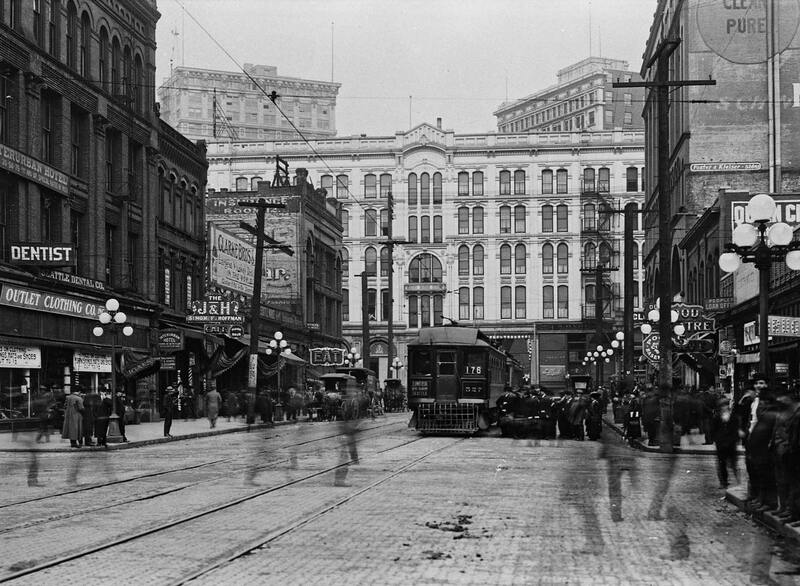 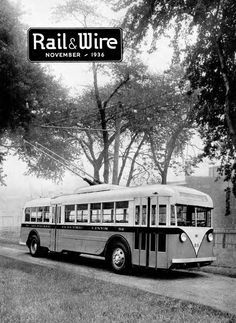 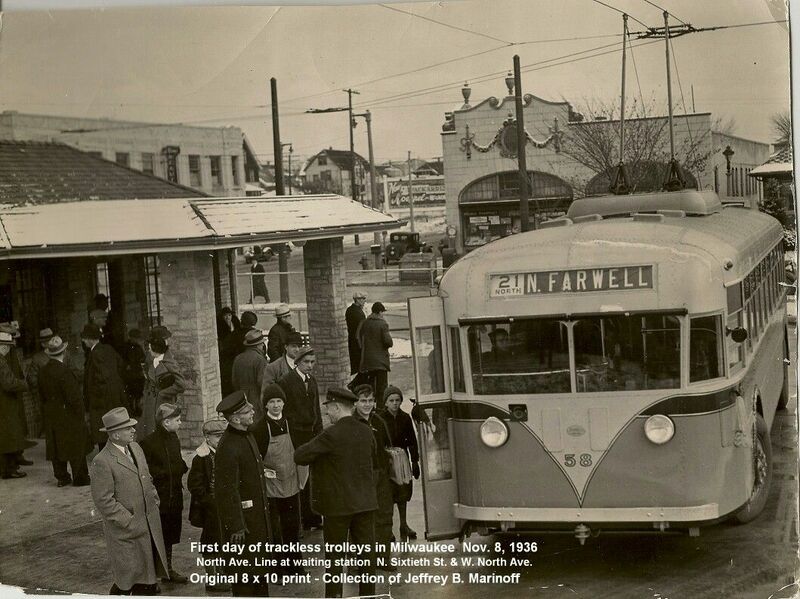 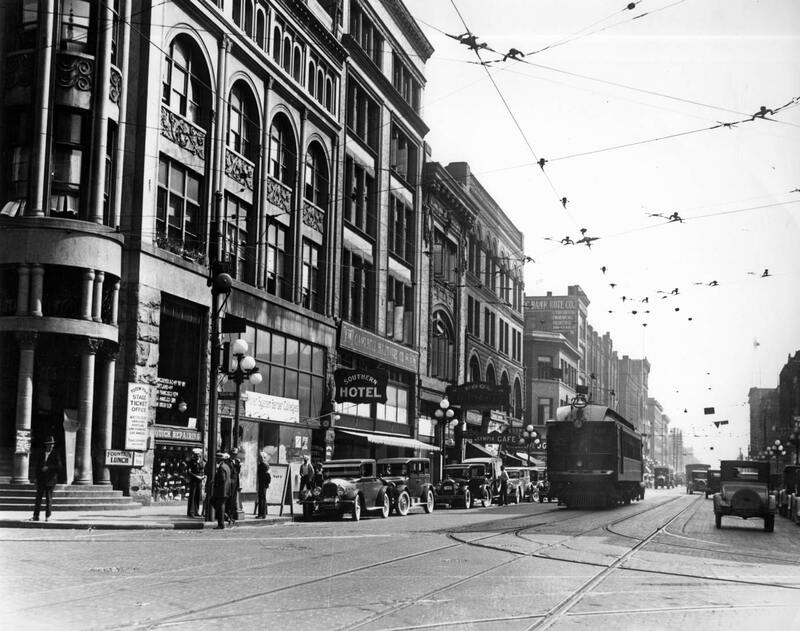 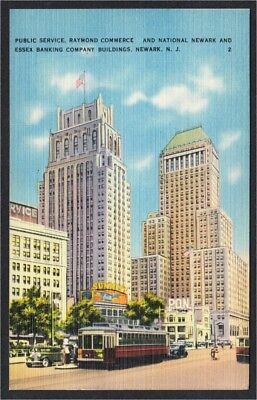 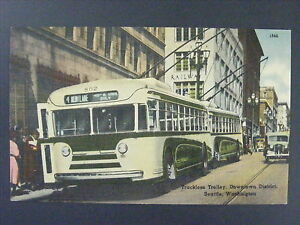 First day of trolley bus service in Milwaukee. 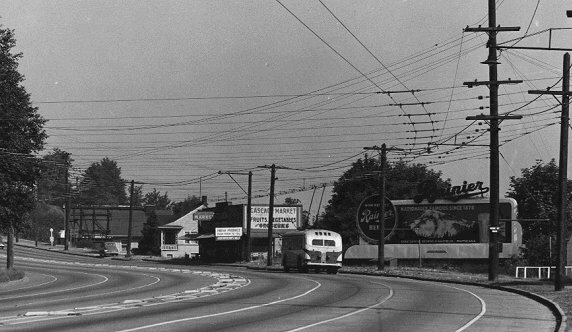 N.60th & W. North Avenue. 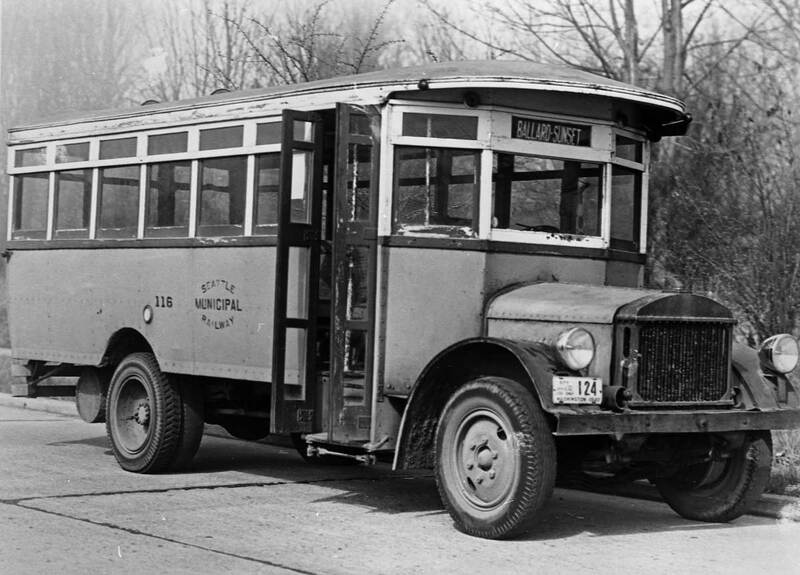 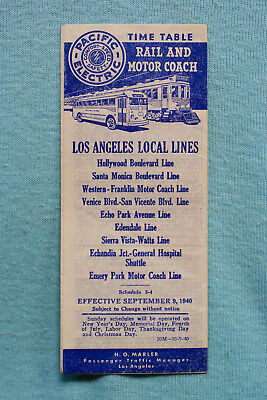 Twin Coach #58-Nov 8,1936. 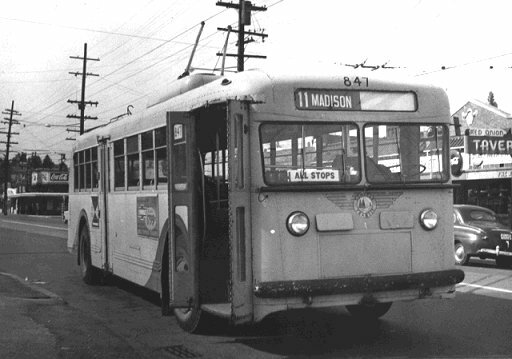 Brand new AM General trolley #956 leaving Jefferson Base on an afternoon tripper. 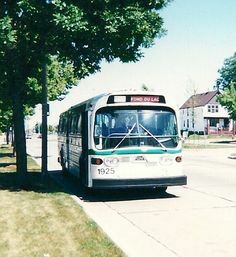 - Photo by Leo Koszewski. 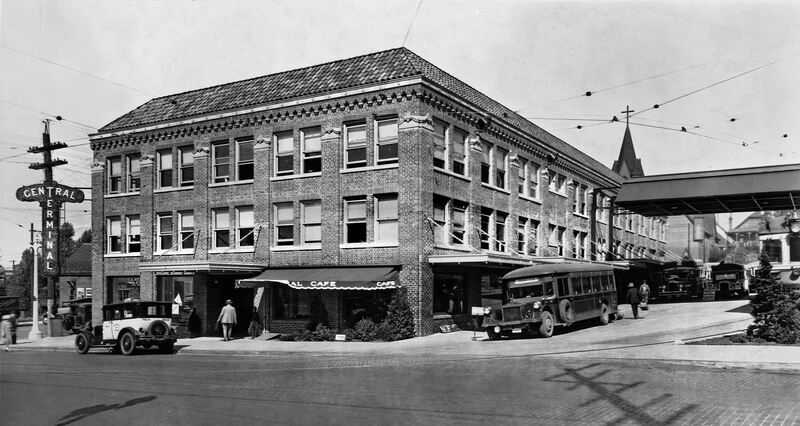 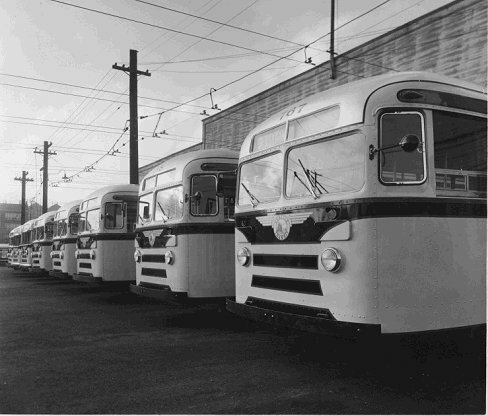 Brand new Renton built Pacific Car and Foundry Brill trolleys lined up in front of the Jefferson Street Station. 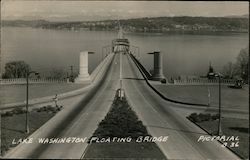 - Photo by Roy M. Peak. 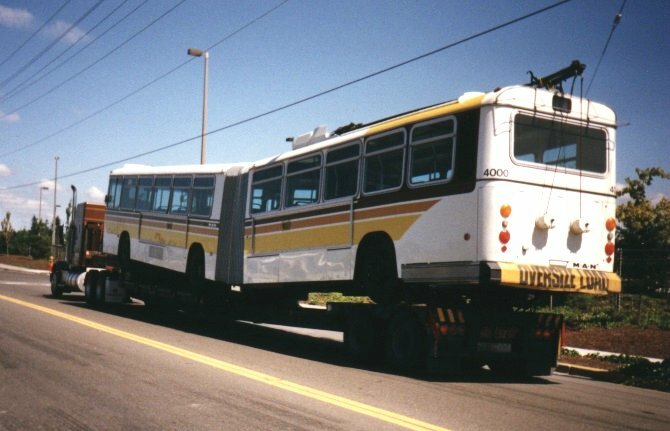 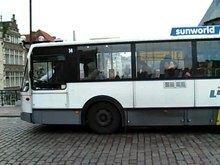 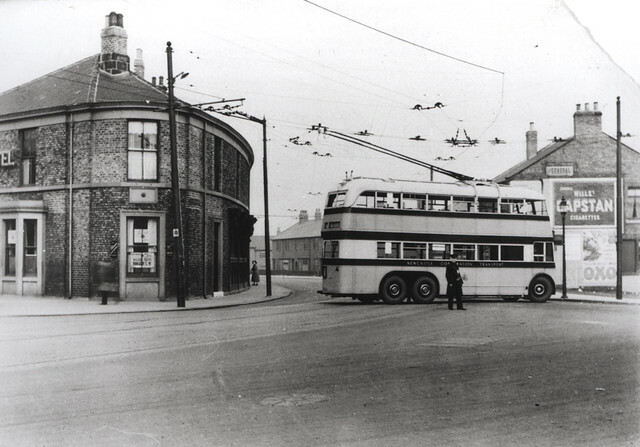 Coach #4000, the first of 46 MAN articulated trolleys, enroute to Atlantic Base for delivery. 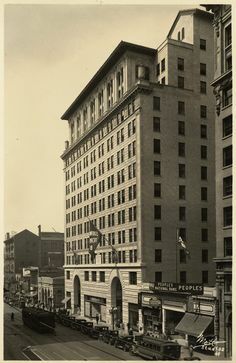 - Photo by Leo Koszewski. 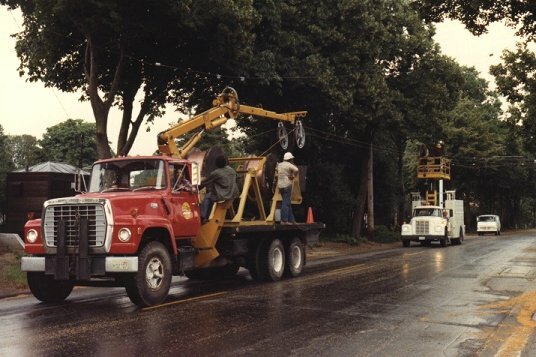 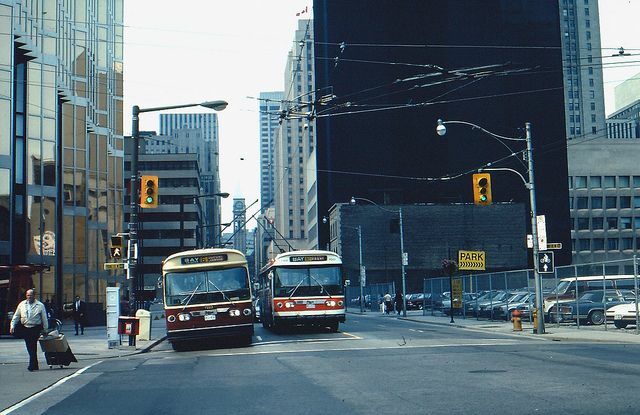 New trolley wire being strung as part of the rehabilitation project on W. Raye Street at 7th Avenue W. in August 1978. 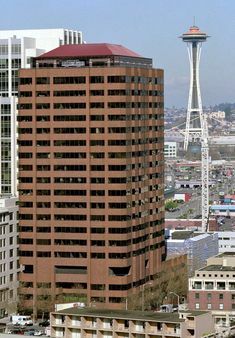 - Photo by Carol Voris. 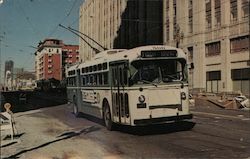 A GM old look bus is westbound on Wisconsin Ave. approaching N.3rd. 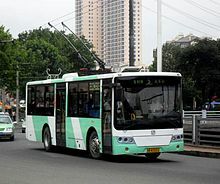 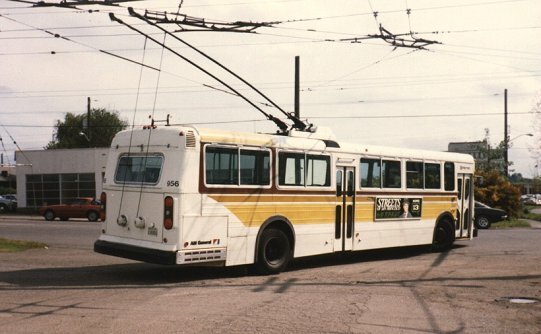 Prototype Gillig trolley #4100 crossing the 12 Ave S bridge on a morning promotional run. 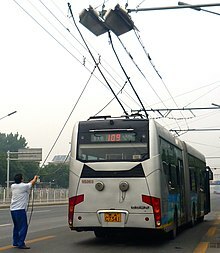 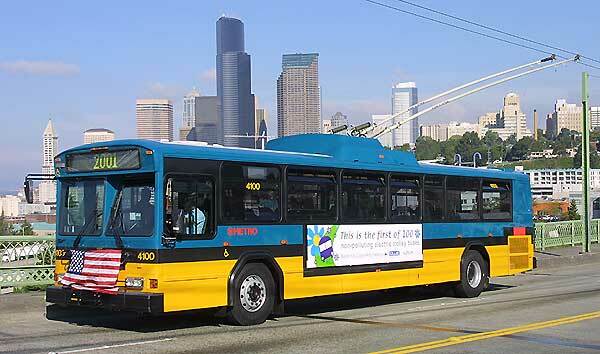 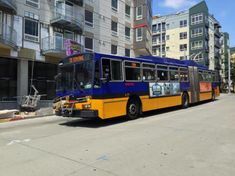 - Photo by Metro Transit. 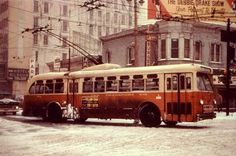 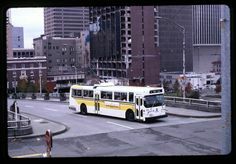 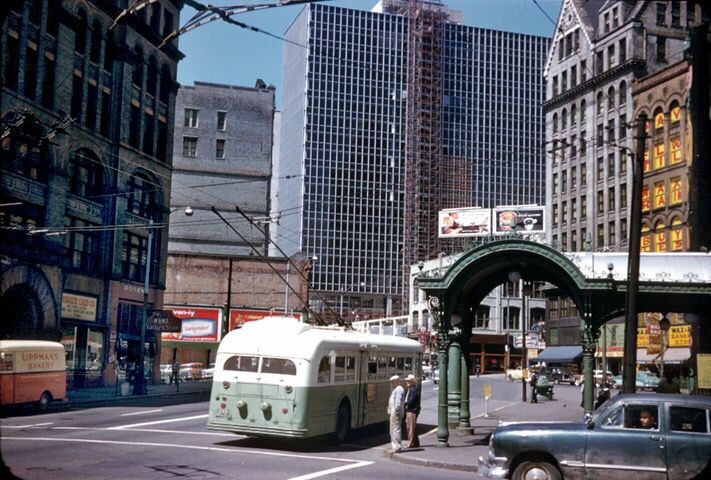 A Yellow Coach trolley bus is stopped at the corner of Milwaukee Street and E.
SEATTLE AMGENERAL TROLLEY COACH 1980S . 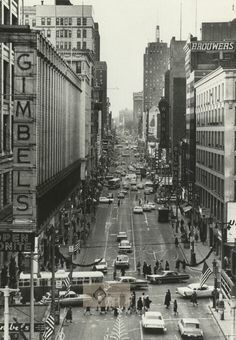 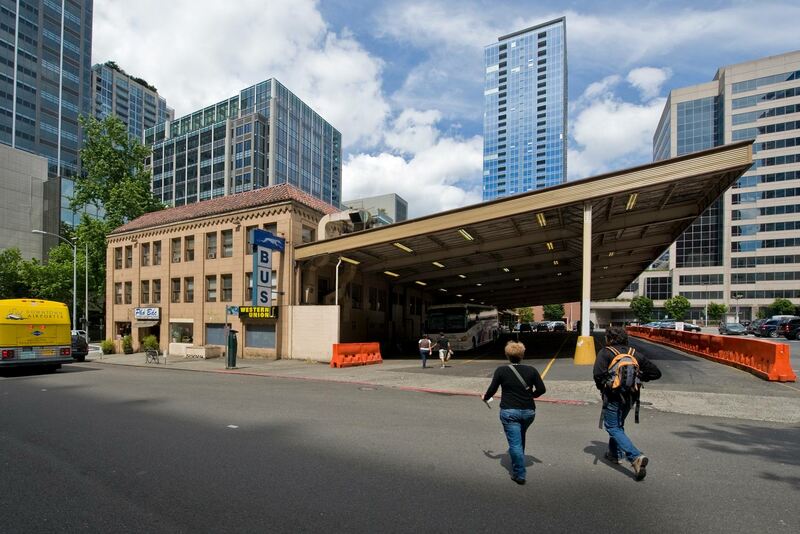 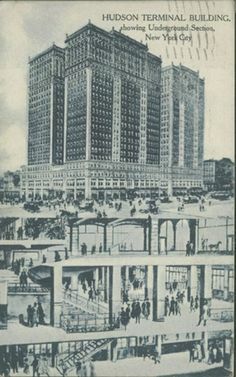 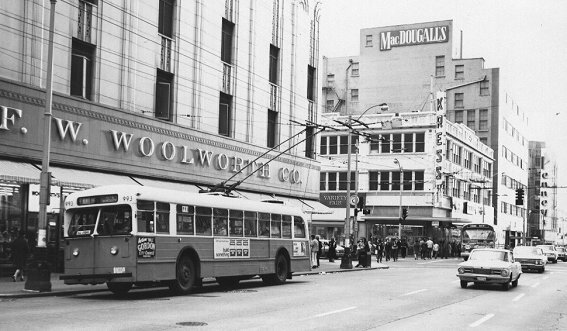 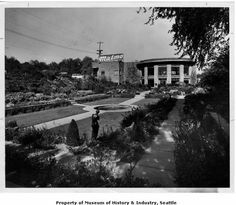 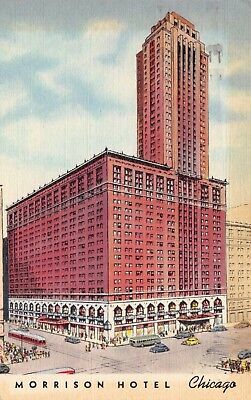 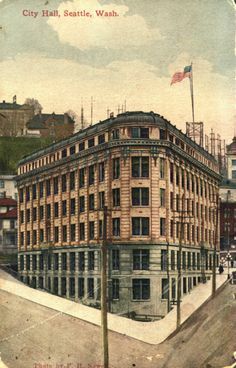 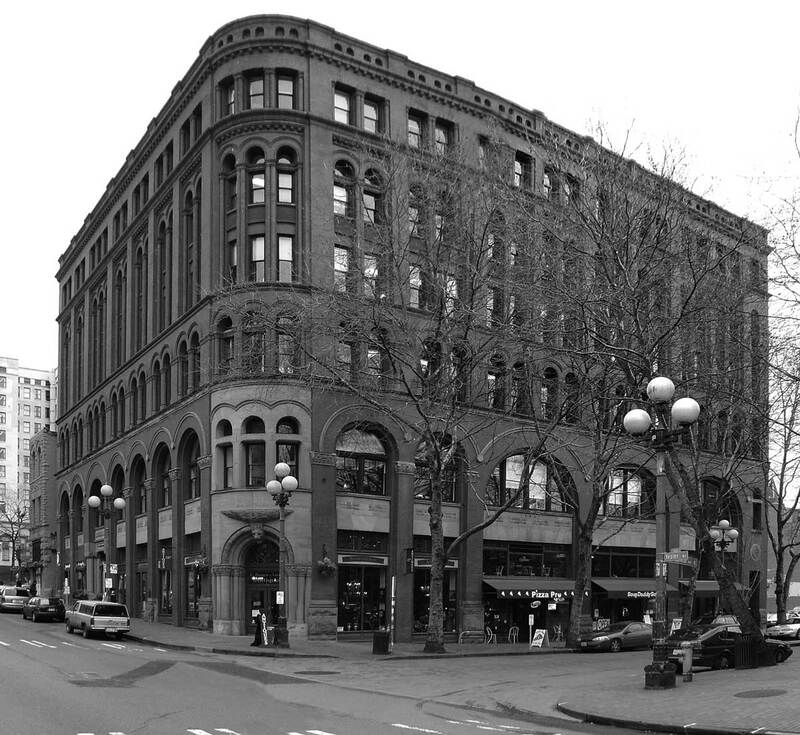 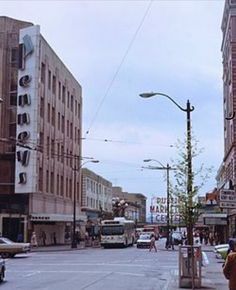 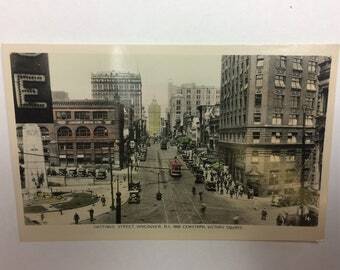 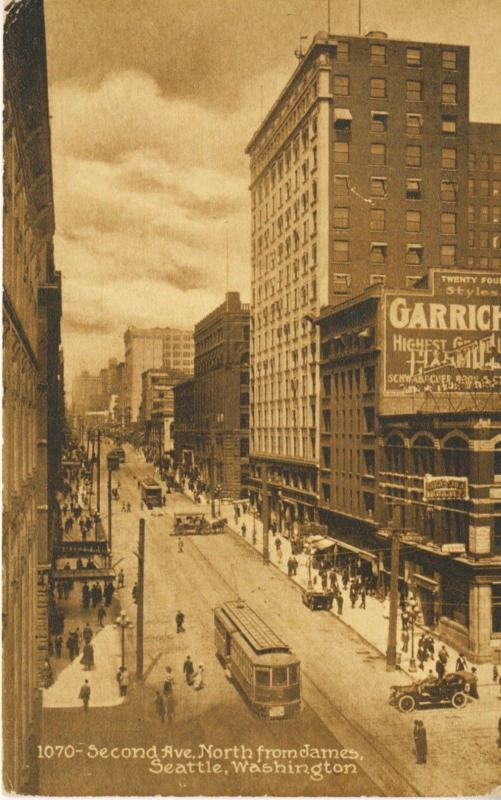 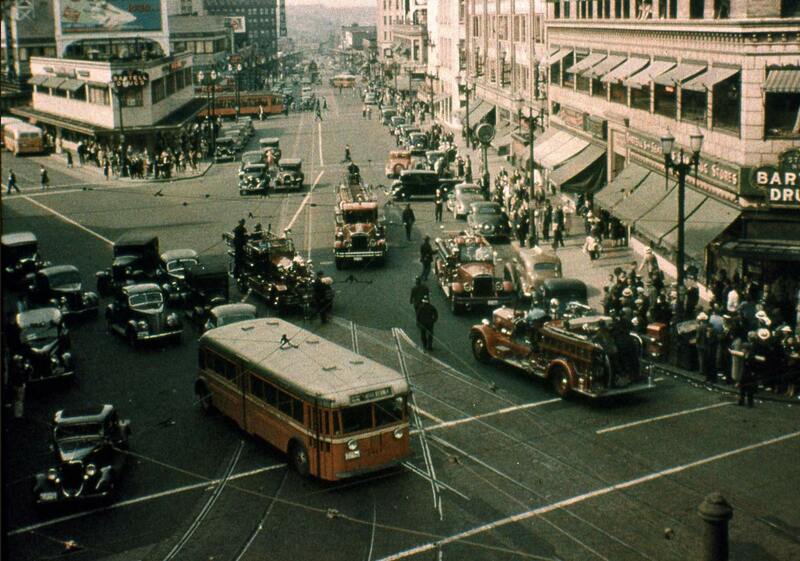 Old Seattle - remember Kress and Woolworth? 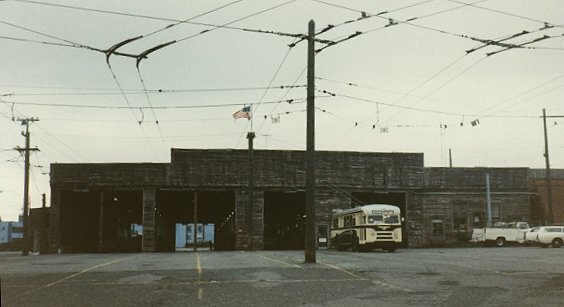 Jefferson Base closed for the last time in 1982. 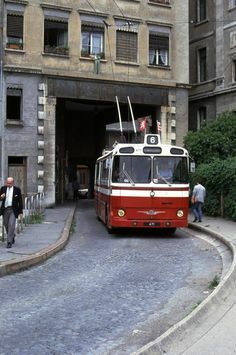 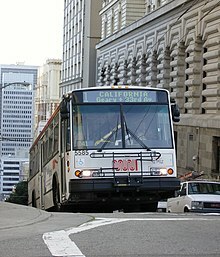 Brill #798 was the last trolley coach to leave the base. 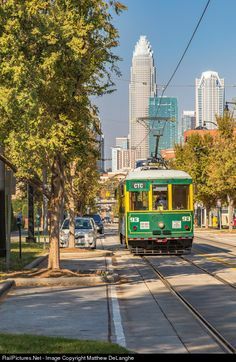 - Photo by Leo Koszewski. 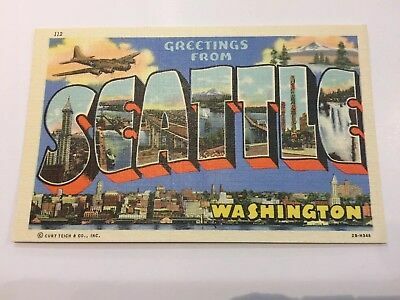 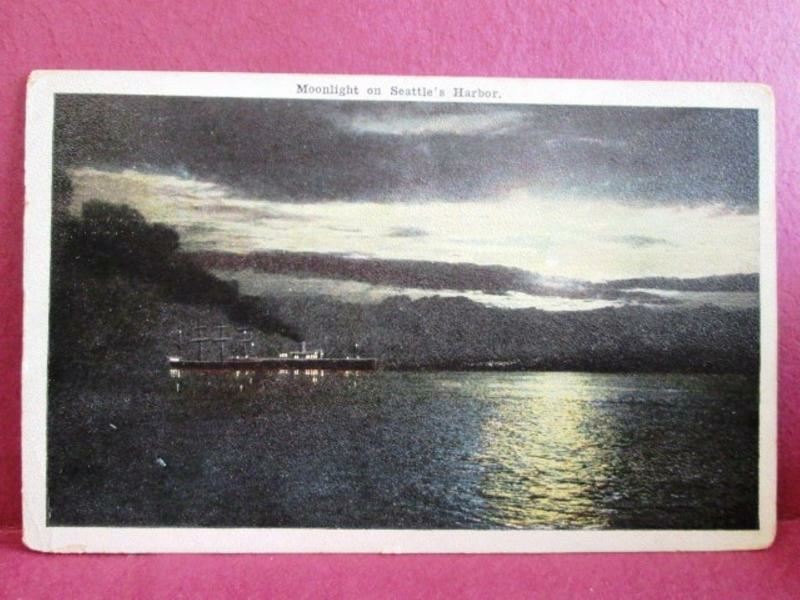 Seattle, WA Greetings Skyline c1940s Linen Colortone 112 Postcard Unused! 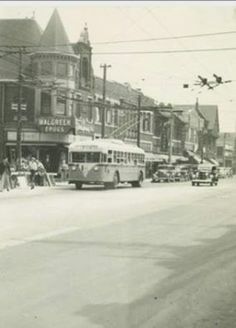 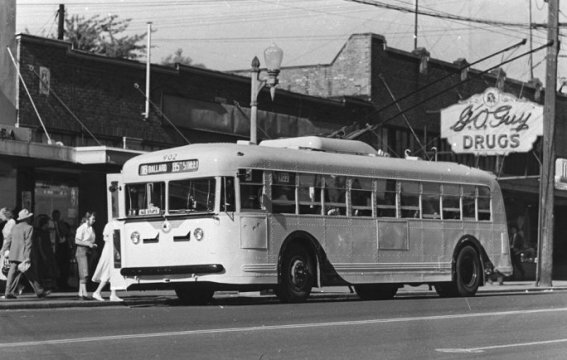 Northbound trolley coach on Aurora Avenue at Howe Street, August 15, 1945. 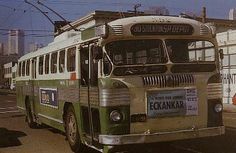 - Photo by K.S. 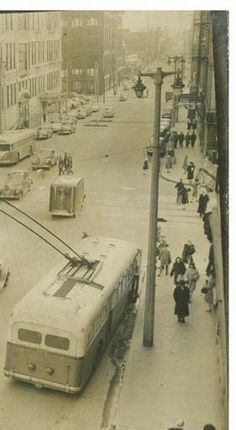 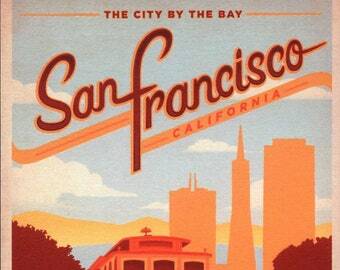 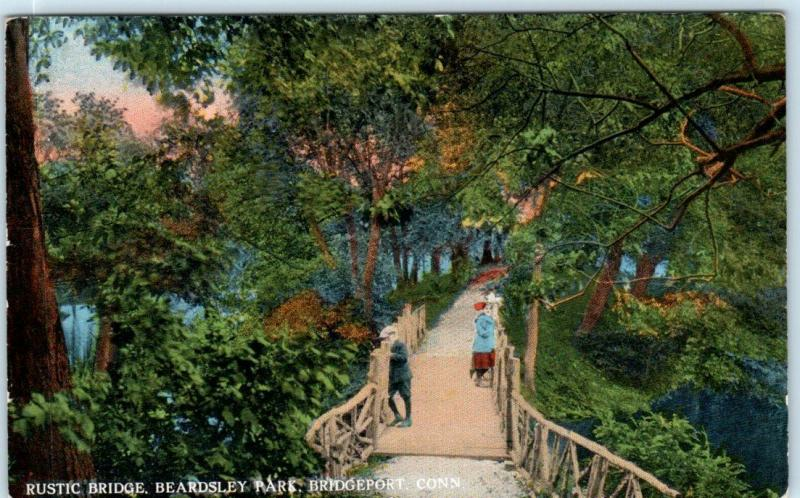 Brown courtesy of the Mike Voris Collection. 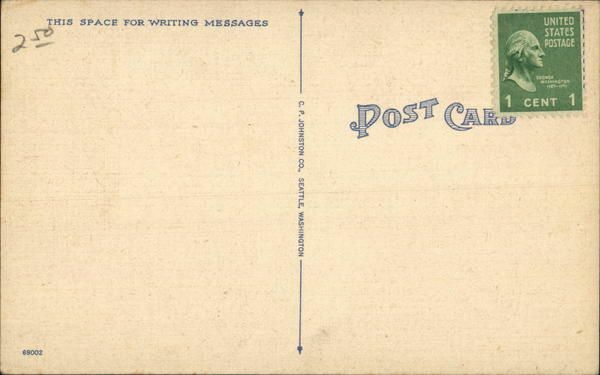 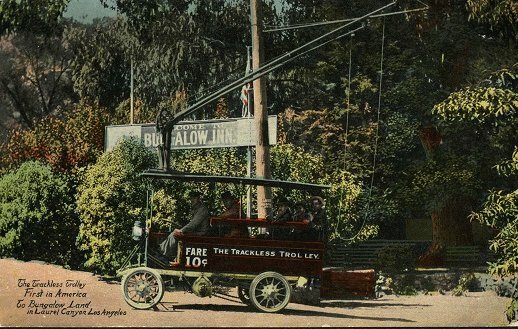 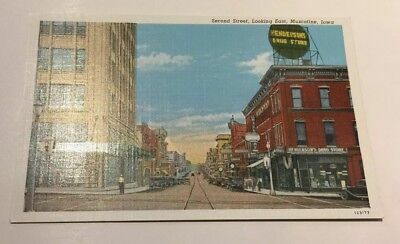 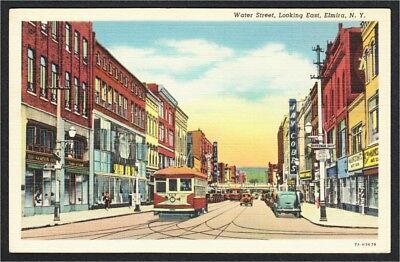 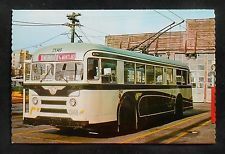 Muscadine, IA 2nd Street Drug Store Trolley Track 1940s Linen Postcard Unused! 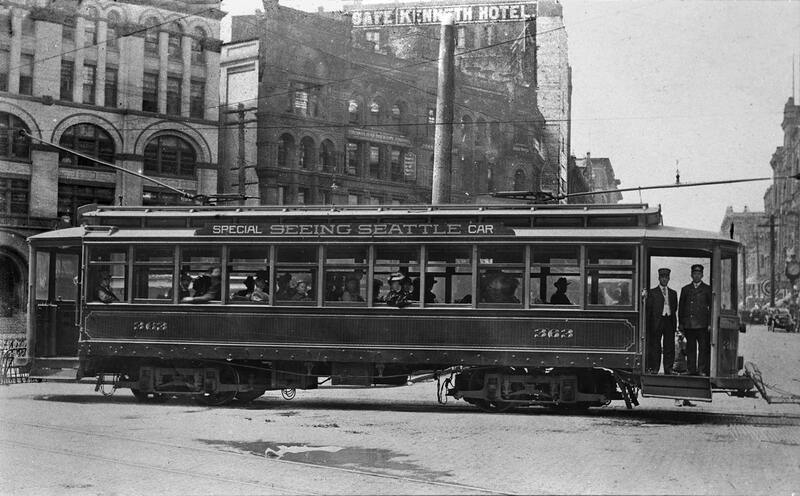 1929 Seattle Streetcar #757, Seattle, WA Vintage Photo 8.5" x 11"